Asya tightened the bolts on the left balance column then stowed her spanner in her leather apron. Turning the power valve, she let steam flow into the automated astrolabe. Pistons shifted and gears crunched as it started calculating stellar alignments. At the top, the great telescope started to rise. “We already did that,” Asya said. “We can do it better,” Genya replied. She glared at his back as he left. At least she wouldn’t have to tolerate him much longer. The Tsar had ordered the machine completed and delivered to his observatory the next morning. Imperfect as it might be, it would do, and she would be rid of Genya, with his ridiculous floppy hair and those madly shining eyes. She adjusted spindles and checked counterweights while she waited for him to finish. What was taking so long? “Are you not finished yet?” she called out. Some instinct held Asya in place. She forced herself to turn away from him, turning dials and tightening screws, examining the motion of the pistons for any sign of misalignment. “I’m sorry,” Genya said quietly. She blinked in surprise. Above her head, the main disk of the astrolabe turned, rotating the telescope to look at the best view it had calculated. Figures danced down the display. “You think my work is perfect?” she asked, amazed. He had been a thorn in her side for weeks. This was utterly unexpected. A grinding sound made them both jump. Asya’s spanner was in her hand before she even thought about it. They rushed around the machine to find the source of the noise. High on the left side, a brass plate was trembling. Gripping tight to any protrusion she could find, Asya scrambled up the casing. Precariously balanced on a bar engraved with lunar cycles, she popped the plate open. Inside, gears were grinding against each other. She could see the tension rippling out through the machine, gears straining, steam blasting from pistons as they tried to move the immovable. The whole astrolabe shook beneath her. “I told you we needed to test the rest,” she shouted angrily as she looked for the obstruction. “No-one stopped you,” Genya shouted. “No-one helped,” she yelled back. There it was. A spindle had slipped loose, the gear it carried tangling with others. She pushed it in and for a moment the shaking stopped, but then the gear slipped out again. She went to tighten it in place, but her spanner was too large. “Here.” Genya held a whole tool kit above his head. He strained beneath the weight, teeth gritted with exertion. Asya snatched out a smaller spanner. She pushed back the spindle, tightened the nut holding it in place, and breathed a deep sigh as the shaking stopped and the telescope resumed its slow, steady turn. With a thud, she leapt down onto the workshop floor and turned, ready to give Genya another earful about testing. Instead she paused, taken by the expression of sublime wonder on his face. Watching the motion of their perfectly tuned machine, she found her own anger ebbing away. The telescope turned. As if sensing its gaze, the clouds parted and the light of a full moon shone down on them. The moon the telescope had turned to view, entirely of its own volition. “You did it,” Genya said. “We did it,” Asya replied. She put the spanner in her apron and let her hand hang loose. Her fingers brushed against Genya’s. Seized by the joy of the moment, she wrapped her hand around his. Her brain had just long enough to register fear at his possible reaction. Then his fingers looped through hers and he squeezed her hand. 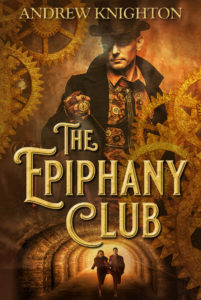 If you enjoyed this story then you might also like Riding the Mainspring, my collection of steampunk stories. You can get a copy for free by signing up to my mailing list.